NTN Corporation (hereafter, NTN) will exhibit at the “AUTO SHANGHAI 2019”, which will be held from April 16 to 25 in Shanghai, China. Under the theme of “NTN bearings, developing with the times,” NTN exhibits a variety of products that contribute to the electrification, fuel efficiency, and high-efficiency of automobiles. NTN will introduce products used in various parts of automobiles, including our core products; hub bearings and driveshafts as well as transmission bearings and seat lifters. NTN will also exhibit module products such as the “Electric Motor and Actuator” series, the “sHUB” a Hub Bearing with Steering Assist Function and “eHUB”, Hub Bearing with Motor Generator Function. Other attractions include the drive simulator equipped with the Mechanical Clutch Unit (MCU) for Next-Generation Steering to allow visitors to experience the functionality of the steer-by-wire, and sections where they can experience bearing assembly and take pictures of trick art using bearings. In the early 1980's, NTN was the first Japanese manufacturer that successfully mass-produced “3rd generation hub bearings,” which boost productivity in assembly of automobiles with fewer parts and a lighter weight achieved through unitization with related components. As the leading company of hub bearings with the leading market share, NTN will continue developing and proposing products aimed at further enhancing vehicle safety and fuel efficiency, with examples including bearings with integrated ABS sensors and modularization with driveshafts. In 1963, NTN was the first in Japan to begin mass-production of driveshafts. Since then, it has focused on development in line with changes in the automotive industry like the shift to front-wheel drive platforms, and to date has delivered approximately 800 million driveshafts to customers around the world. As the pioneer of driveshafts, we naturally pursue durability, vibration performance and transmission efficiency while also seeking to create value for such as modularization of hub bearings, our basic product. Combine its core technologies of bearings and ball screw product technology with motor design technology and electrical control technology for controlling vehicles to develop the “Electric Motor and Actuator” series. The product lineup features common components and specifications, and available with variations in shape and size, which eliminates the need for individual designs and contributes to a shorter development time. NTN has developed the industry's first hub bearing with a steering assist function that can be equipped on the front wheels by combining a mechanism that adjusts the steering angle of the tires on a hub bearing. Optimally correcting the steering angle at the left and right wheel improves both stability when moving forward at high speed and vehicle cornering performance in addition to also contributing towards improved fuel efficiency while also stabilizing the vehicle during emergencies such as when the vehicle starts to skid. 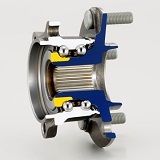 Module product with a motor generator integrated into a hub bearing that supports the rotation of tires. For front-wheel drive vehicles, the product is installed in the rear (non-driven) wheels to reduce engine load and assist with power regeneration when vehicle starts and accelerates. The modified version has been developed with an optimized internal structure for a much more compact size and significant improvement in permitted rotational speed with the same level of performance as conventional products. 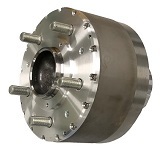 A compact clutch product for steer-by-wire systems that combine an electromagnetic clutch and roller clutch. A high load capacity design ensures a high level of reliability when the mechanical link is active. The system is used as a backup mechanism that provides a mechanical link between the steer-by-wire steering system and tires, which is instantly linked in the event that there is an electrical malfunction to allow ordinary steering operations. A drive simulator will also be on show so that visitors can use the features of steer-by-wire. The functions of the next-generation steer-by-wire system equipped with the MCU will be outlined in an easy-to-understand manner on the large monitor in the simulator. Visitors will be able to experience for themselves the difference in steering that conventional systems cannot provide.